Got two new pens in for you guys to try out. 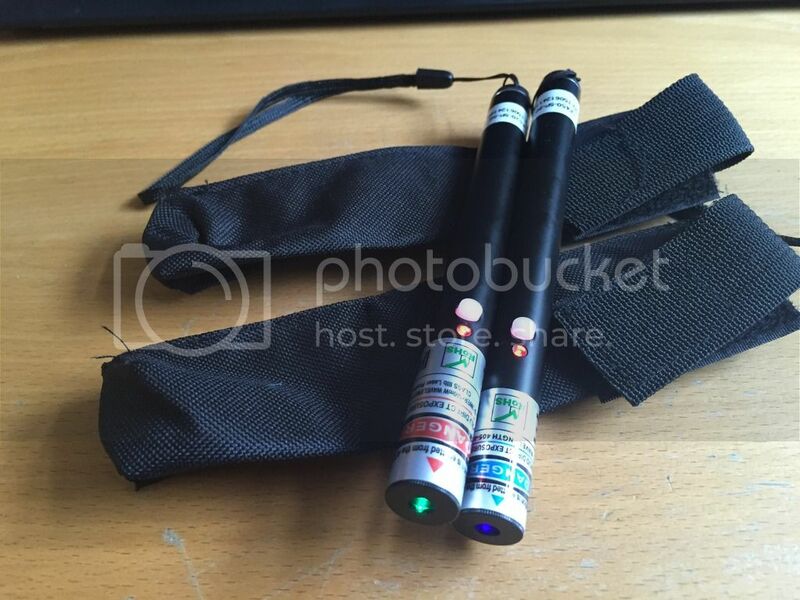 These are both diode powered pens. 515 and 405nm. These have different modes! there is a mode for indoors. In this mode you use the laser at 5mW. When you hold the power button it wil switch to outdoor mode. It then is 50mW. You also have a pulse mode. If you want to try these message me. The way it works is as follows. You send me a deposit and shipping fee's. If you return it i will send back the deposit. If you want to keep it i will keep the deposit. Could you post a picture of the [PL 532nm 1x18650] beside a [HL 532nm 1x16340] beside a [HL 520nm 2x16340] for length comparisons? Howdy, I've been trying to purchase your LP 520nm 532nm 1-50 and I keep getting the message "The link you have used to enter the PayPal system contains an incorrectly formatted item amount." when I add the trackable air mail shipping. The final displayed price is $35.9, I think that is the problem. It should be $35.90. 10mw is not available i think.. Because that doesn't happen when buying 20mw or 50mw. Do they include batteries? and if so does that present any problems when shipping to the US? No they don't include batteries. So no worries. Cool things! I love it! From MAY1,2008 to MAR24,2017,we provided many laser pointers, we try to be better,but we know we cannot make everyone satisfied. Now we stop this business,thanks to all kind buyers in the past years! So I'm guessing laserbtb is no more? Yes, unfortunately they are gone, -Here- is a recent thread discussing their demise.